I wrote how we'd made a few games for my son's school to help them raise much-needed funds for the school. The fates and events held at the school hosted via the PTA are so important due to government cuts and schools struggling to keep their Teaching Assistance staff, Support staff and non-core subjects going! Last year, two parents were completing a run for the MS Society and the PTA decided to put on an Easter Eggstravaganza event on the last day of school with 50% of monies raised going to the MS Charity and 50% going back into the school fund. I can't always dedicate my time to these events as a volunteer due to work commitments and my son's after-school activities. But what I can do is help in other ways, and for Easter, we created a bean bag throw game. 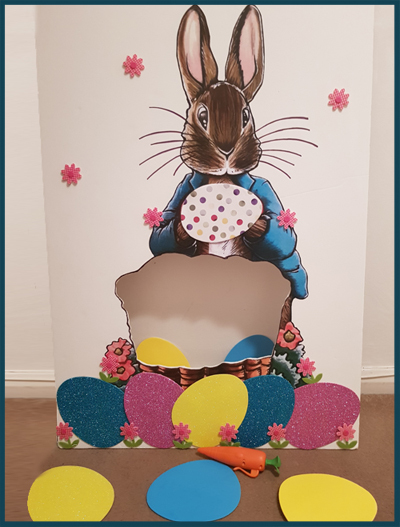 The big movie at the time was Peter Rabbit and being Easter, I felt he was the perfect character to be displayed on our A1 foam board. I have several of these at home, which I sometimes use as backdrops for photos. I did have a set of 4 thanks to Hobbycraft having them on special offer, and after donating one to create Olaf at the Christmas Fair, I've now donated one for Peter Rabbit. I originally wanted (read that as I wanted my partner) to draw Peter straight on to the whiteboard, but a lack of confidence and time meant we went to plan B. I photocopied a picture Peter and blew it up several times to fit on to my board. 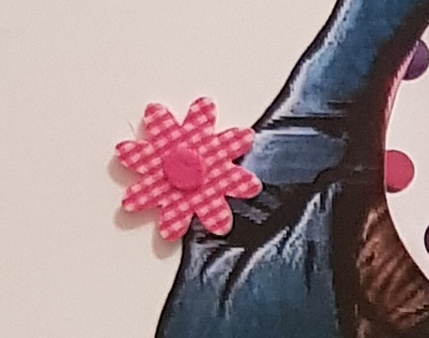 Due to blowing up the sheet, it left with gaps around the edges and a slightly misshaped Peter, so to compensate for this I added little flowers strategically places around the board so as not to make it obvious he elbows were misshaped. Once the glue was dry I set about cutting out Peter's basket, in hindsight I could have done with leaving more of an edge to show what it is, as I think it just looks like a big random hole! This is a very quick and easy game to make and the end result I feel looks amazing and bright and exactly what you want for children. I hear it was a success and I'd like to think that Peter along with his homemade carrot beanbags that another parent made help raise the £500+ for the school and charity. Never be afraid to give it a try, even if you make a mistake it's usually fixable with a little cover-up. I'd be interested to hear if your schools are struggling with budgets and if you guys help out in some way, are there other ways we can raise funds? Thanks Rebecca, Max and his dad loved the movie too, they were proper laughing at it. I think they like the slapstick element of it.